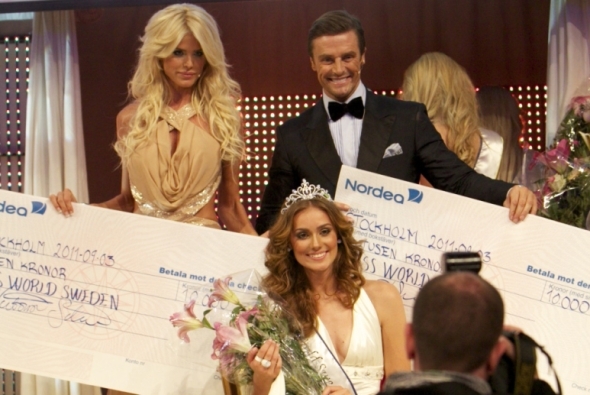 18 year old Nicoline Artursson from Halmstad was crowned as Miss World Sweden 2011 in a pageant held at the Winter Garden -Vintertradgarden- of the Grand Hotel Stockholm last September 3. Placing the crown and sash was outgoing Miss World Sweden 2010, Dani Karlsson together with the reigning Miss World 2010, Alexandria Mills. The 1st run-up was Malin Brattstrom and the 2nd run-up was Maxime Calington. Completing the Top 5 Finalists were Sara Bolay and Helen Beyto. Nicoline Artursson will be the representative of Sweden in Miss World 2011 beauty contest on November 6 in London's Earls Court in London, United Kingdom. Julia Morley, Chairman of the MWO also attended the event, which was hosted by Victoria Silvstedt, Miss World 1993 Top 10 Semi-Finalist.